I so agree, I love a story which makes you laugh and cry, and if it can also make your heart ache and gut clench all the better. I agree with what you have written. I prefer character driven stories. And in your books, only once did I not connect to the heroine. I am not someone who is in any way similar to any heroine in a romantic story. But, I do believe I understand human nature. And when a woman looks from one perspective and slowly changes that perspective to welcome new ideas, I believe that is the perfect illustration of your heroines. They learn to see the world in a different way and generally that new way includes a man who helped her find a new outlook. I really enjoy your blog posts about how you construct your books. Even more, I enjoy your books. Imagination is such a gift, just like artistic and musical expression. I love reading your stories because they engage my imagination enough to make your stories a wonderful way to escape into a different world . You have a beautiful gift and I’m glad you share it with your readers. The emotional connection with a character is what, for me, raises a book from pure entertainment/escapism to a more satisfying and connecting experience as a reader. I need to believe in a character, and all their flaws and quirks, in order to get into their headspace and live in their shoes for the length of a novel. Real, fleshed out, human characters are what draws me to your novels and makes such a lasting impression (and makes your books my most recommended to fellow romance readers!). Absolutely love books where I can become attached to the characters. Sometimes you just relate to them and want things to go their way. Sometimes they are so engrossing you feel like you are them (for the length of the story). Either way, if you can’t become attached to the characters somehow, you won’t care about the story. Love reading your books. I can’t wait for the next book in Westcott family to come out. I believe you are a master at creating a bond between the reader and the characters! I find I am very much invested in their lives and want to keep reading about them long after I’ve finished the books! I like characters more if they aren’t too perfect because perfection can be quite boring. Most believable heroes and heroines do and say things that make us readers feel like we know them (or someone like them). When the author does it right it’s sometimes like finding long lost friends. I love your books. And one of the reasons is you really do achieve what you have set out above – the characters and their relationship do come across as possible, probable and likely to last. But therefore I find most other books of the genre pale in comparison, apart from Georgette Heyer of course! Only a Kiss was my favourite of that series. I have taken it out of the library four times now and would love to have my own copy. This is why I enjoy your books so much. Your characters are real! Looking forward to new books and rereading the old! I enjoy reading your novels because the characters do grow as they experience life’s situations. I love your books. I always feel like a part of the scene…the vivid detailed descriptions of the surroundings and the characters brings everyone and everything to life. I loved reading your background as well. Thank you for bringing the character and the reader together. 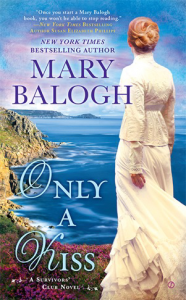 Mary your characters always seem so real – probably because like us, they aren’t perfect! And I always connect with your characters and stories and never want them to end. I guess that why I love it when you weave previous book’s characters into the current story – it’s like I get a glimpse of them living their happily ever after. One of my favorites of yours starts out on the Waterloo battlefield, with our hero discovering the heroine’s brother dying. His feelings are vivid, while contrasting with his ingrained British stoicism. It was a stellar opening because it immediately caught me up in both the hero’s and the heroine’s emotional lives. I was investigating a famous mystery author after reading, and enjoying, a book in one of her series. The reviews of the next book pointed out the lack of connection with the main character (a minor character in the rest of the series) saying the reader never really liked her and her bratty behavior. No emotional connection means no empathy for the plot. I decided I’d skip that book in the series. Interesting to see your thought processes ad you develop those personalities. Whatever you do, keep doing it. You have some of the most remarkable characters in fiction. I’ve always found your characters real and relatable. I think that’s part of the reason I’ve devoured most of your books. Some authors make their hero too perfect, without any flaws, which makes the story unbelievable. I loved reading your biography. Some of my ancestors were Jenkins from Merthyr Tydfil. I grew up proud of my Welsh heritage. I hope to visit someday! I totally agree with you. This is why I love to read romance novels. I want to be content at the end knowing the hero/heroine I spent a day reading will live happily ever after. And all this is why I love so very much the way you write your love stories…I can feel all of it. I can relate to them, I can feel their sadness and rejoice with them. Thank you Mary. I so agree. Sometimes it’s wanting to throttle a character, rather than identify with a character that keeps me reading, but it’s still an emotional response. I have to connect deeply to the characters in a book(story) to get a satisfying read. I need to see the intelligence, compassion, humor & flaws within all characters for them to walk into my thoughts & live long in my heart. I definitely have favorites who garner my respect & always merit another lovely read. I, too, read Georgette Heyer, Sandra Heath, Barbara Cartland, etc. growing up & simply LOVE regency stories. Thank you for giving so many, especially me – a oodles of reading pleasure! I would definitely agree. Character wasn’t so important for me when I first started reading your books – well, I was fairly young. Now it’s much more important to me. There will always be books I go back to like Silent Melody because the characters just keep pulling me back. And Emily’s deafness and muteness made it so unique. Thank you so much for sharing your writing process with us. It is exactly the fact that you write from a deep point of view that we are able to connect so well with the characters in your stories. You make your characters so real, brave, vulnerable, selfish yet caring and that’s what make them so believable. You are able to bring this out with such creative writing, even in your short stories, and that is why you are my favourite writer. I am so looking forward to the next two Westcott instalments! I love when every emotion is experienced in book… That is what makes them great. I have to agree with Sarah as Silent Melody is my all time favorite story and you can’t help but fall in love with someone as warm hearted as Emily. What an amazing character. The Survivors Club is also my favorite series as each of the characters had the worst battle wounds either physical or mental and loved how each over came them and accepted them. 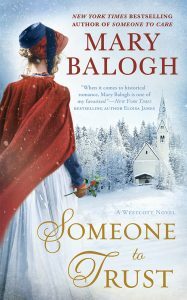 You are truly my favorite writer Mary Balogh! I appreciate your way of giving the protagonist characters depth, sometimes faults, past hurts or other proiblems to deal with. I also epecially enjoy seeing both protagonists’ POV alternate, to be able to identify with both, to discover both their feelings. Some writers keep to one party’s POV and we can only guess the motivations and detailed feelings of the other half of the couple, which I usually find too angsty or annoying. I have read many of your books and I was almost always able to sympathize with the heroine and hero, even if I disagreed with their decisions. You are one of my favorite writers because of the rich, multilayered characters you create. The first of your books that I read was SIMPLY LOVE. I had just retired and started reading again. I pulled it off a library shelf because it looked interesting. I was not aware that it was from the middle of a series (Simply) that had characters from that series and a previous series (Slightly). There were so many side characters that I admit it was confusing at times. But I couldn’t drop the book because I had “fallen in love” with the hero and heroine right off the bat and couldn’t stop reading it until I knew they would have their HEA. It’s interesting to see the process you go through to create such rich characters. Very interesting article. I’ve always thought you have a special talent to translate emotions into paper and now I understand a little better your writing process. This committed relationship that blossoms between reader and main characters is indeed what makes your stories so wonderful. The best books are those where I fall in love with both the hero and the heroine and am emotionally invested in the story. If a story can bring me to tears, I consider it especially successful and well written. Your stories and characters work so well that I believe most readers want to know what “happened” to the people in your books after the last page. And I admit I’m one of them. The love story that I like best is Anne’s and Sydnam’s because on one side it is so unusual but at the same time completely realistic. I agree that you are a wonderful creator of believable characters. The Survivors Club Series are my favorite. I so liked their group effect and how they supported each other, I loved taking each one o them through their healing and falling in love. They were real life people who found wonderful partners. I liked how they all came together in each book for special events or their annual gathering. As a nurse, I admire their strength and how they faced life after the war. I have been enjoying your other series as well. Thank you! you have perfectly stated why I love your book so much – I find that I get engrossed in the characters and that there is always growth and change in them as the book progresses. Love your books. So happy you keep writing them! Love the dueling points of view in your novels! this is so true, there are many books I do not connect with because I cannot “feel” the character. I do enjoy your stories so much because I really feel! I miss the characters when I finish the story so that proves how believable they are. Thank goodness for series so I know how they are doing. Well done, Mary, and thank you. Mary, thank you so very much for your beautiful analysis and shared wisdom. I feel that much of what you have presented as the true kernel of what many of us love about romance is being lost in much of what passes for romance today. I am going to print out your words and remind myself to refer to them frequently as I try to ready my own books for release into the world. I fell in love with your books many years ago, I can still hear the Welsh accent in your voice and visualise the scenery. I feel joy when I find out you are publishing a new novel.. I can reread your books time after time. I adore Wulfric and Christine, but I just cannot pick my favourite book as they are all favourites. I agree wholeheartedly with you! I’ve always believed that the best books are the ones that affect me emotionally in some way and make me think of the characters long after I’ve finished reading their story. Especially in the romance genre, I find that having an emotional bond with the characters is so very important. After all, I’ve got to care about them getting their happily ever afters. I don’t look for perfect cardboard characters, but rather ones who may have their faults, but strive to be better — ones that I can cheer for! This is the main reason I read love stories. I get to fall in love as they fall in love. Thank you for all that you have written. Your insight explains why I love your stories so much – I’ve always said that you have the rare gift of bringing your characters to life in a way which brings us on the journey with them. I also love how you bring about healing in all of your characters. Love requires vulnerability – a scary thing – and the strength to entrust another with one’s vulnerable heart, especially when the heart rarely goes through life unscathed! According to St. Augustine, love is defined as willing the good of the other (a heroic effort in every sense) – and it’s always a breathtaking journey with your heroes and heroines to see them find that special “other” to whom they can entrust their bruised and healing hearts! I enjoy your novels that constitute a series eg The Bedwyns, The Survivor’s Club, The Westcott’s because I become so invested with the character’s that I can’t bear to let them go. Short of rereading the novel straight away a book series allows me to move onto another family member or friend without losing touch with a beloved character. Also by reading a series one still gets further insights into a character’s ‘make up’ even as they take part as a peripheral character rather then being the main focus. I love to find out what is happening to them and whether they have had children etc. I particularly like it when you include a “get together” in one of your novels and love to see the interactions and friendships between the various couple/relations/friends. However, I find rereading a whole series on a fairly regular basis allows me to stay connected with the characters and sets them firmly in my mind so that remain ‘friends’ to me. I’m interested in the term “deep” POV. I wonder what makes it deeper than the regular third-person POV. Or is that just your perspective on how far you go into the character’s emotional state in addition to his or her thoughts? The best kinds of books are the ones where you aren’t just invited in, you are made part of the story. While I started with Bedwyns and will always hold a special place in my heart for Freya, the Survivors Club devastated me. I was in the room with Imogen when she finally shared what happened, and felt her pain alongside Percy. It takes a special gift, beyond knowledge of the craft, to create that sense of depth and connection between the Survivors, and with their eventual spouses. Thank you for sharing some of your craft as well as the gift of your novels. I love your books. You write about real emotions, real people who laugh, cry, feel pain with a broken heart, love…. I specially like when you write about good human beings, like all the heroes/heroines of the survivors club. It feels real and that makes a stronger connection. My mother took all four of the Westcott books I had and she is now expecting the fifth one to show up at any moment. No, I haven’t had the chance to read them yet. And won’t for some time, since she’s going to loan my copies to my sister. Good thing we all like each other. I love books where the author has drawn the characters as richly human. I don’t think I can enjoy a book unless there is some way I can identify with the characters. That is one of the biggest reasons I love your books. Love your books. Love the continued story of the survivors. Reading how they adjusted to life and over came so much by just being there for each other is uplifting. You write the character so clearly that they come to life as you read their story. Thank you for creating characters we remember long after the book is finished. I have always felt that character is very important. If I don’t care about the characters in a story, it doesn’t matter how great the story. If I actively dislike the main character as I did in a mystery series, then the story won’t matter as I won’t care what happens to the character. If a beloved character in a series is missing from an installment, I am resentful throughout the reading (in a different mystery series). In romance I want to root for the couple to have their happy ending. If the characters are not well-defined and I haven’t connected with them, then I won’t care and I won’t finish. I love reading your books they make he feel like I am part of the story. Some times I wish the stories will carry on and on Maybe few years later to see how they continue on with there lives. I enjoy your works, they never become ‘old’ they are timeless. I have reread your books several times and each time I still enjoy each book as if I were reading it f0r the first time. Your books got me through a very dark phase in my life. I recently finished reading Deceived and loved it! I like that the characters are not black and white – and the reader is exposed to all the complexities that real human beings experience. My favorite book in the Westcott Series is Camille’s story – her reaction to the ordeal in her life felt very real and she just seemed like a very real person to me. The love stories you write are deep. I love to follow the growth of the character, overcoming their fears and finding strength on the love they feel. Thank you. Thank you for the gift of wonderful stories. Crafting characters and plot in a manner that draws your readers into the story takes imagination and dedication. And I appreciate it! I hate it when your books end because I have gotten so close to the characters that I miss them when the story is done. Obviously, this could only happen if your characters are “real” to me. I know it`s a good book if I find myself yelling at the characters for being stupid! Crying for them or with them. Your books are always an emotional investment. This is spot on. If I di not like a character, I end up not liking the book. I do think it is easier to connect with a vulnerable person. We root for him or her. I so enjoy the way you write relationships in your books, they are supportive and lovely to imagine.